HALIFAX -- Two award-winning Canadian gospel choirs wowed unsuspecting pedestrians on a busy waterfront Saturday morning with a surprise performance, signifying a cross-country harmony between the two groups. 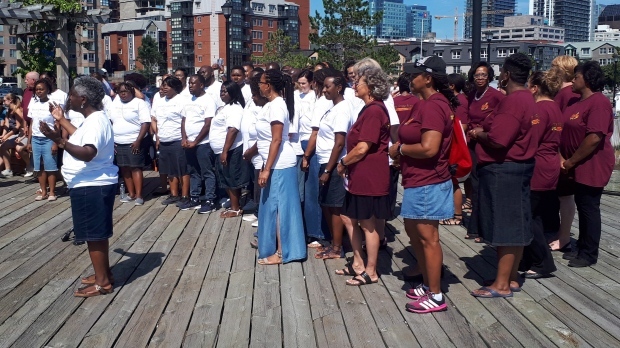 The Toronto Mass Choir is in Halifax for the first time to perform a Saturday night show with the Nova Scotia Mass Choir, and members from both ensembles gathered on the Halifax waterfront to give onlookers a taste of what they do. "We want to make a splash in Halifax," Karen Burke, Toronto director and conductor, said Saturday morning. She said the union of the two choirs is significant because there aren't many gospel choirs left in Canada, and both of them have lasted for decades. Toronto's choir celebrated its 30th anniversary in October, and Nova Scotia's choir isn't far behind at 26. Though both choirs began with mostly black members, they now have a mix of people from all sorts of backgrounds, with Burke saying the Toronto choir has members from South Korea, Jamaica, South Africa and India. "We're celebrating the fact that cultures are together, so it's an inter-provincial, but also a multicultural expression of gospel music," Burke said. "When we come together, it's evidence of the power of the music and also what happens when people get together for one purpose." Despite the Saturday morning heat -- 35 C with the humidex -- dozens of choir members sang, clapped and swayed to the beat of traditional gospel songs such as "This Little Light Of Mine" and "Amen." The group seemed to be a hit with their audience, many of whom sang and clapped along. Over the years, Toronto's choir has won a Juno Award, among multiple others, while its Nova Scotia counterpart has won two East Coast Music Awards. Deborah Sangster, recently elected president of the Nova Scotia Mass Choir, said Saturday that their diversity is what makes them so successful. "Basically, we're all humans. We can all get along," she said. "Sure, we have differences and we come from various countries and various cultures, but at the core we're all beings on this planet and we can all unite for the common good for all." She said the Nova Scotia choir's mandate is to sing for racial harmony and peace, and show people what a multicultural and multiracial group looks like. It's a sentiment shared by Christoph Ibrahim, a son of Egyptian immigrants who has been singing with the Toronto choir for six years. Ibrahim, 26, said he found a sense of community through the group and he's glad both the Toronto and Nova Scotia choirs share a common goal of unity. "It's the joining of two worlds," Ibrahim said. Community-building and togetherness is a common theme for why people choose to sing in choirs, said Angela MacLean, a student minister with the United Church of Canada. In March, MacLean presented her graduate research project at the Atlantic School of Theology in Halifax on how singing in a community choir influences someone's spirituality. She said the people she spoke to during her research reported feeling uplifted after a music session with their choir. "Music certainly does do something for the soul, and that definitely came out loud and clear," she said in a phone interview Saturday. In her research, MacLean said several key themes emerged -- the feeling of togetherness, compassionate connection, and a sense of hospitality and belonging. She said the act itself of creating music can build communities, break down barriers and forge bonds between people. 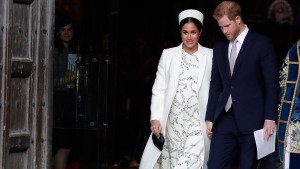 "You have all these different people from all sorts of different denominations, all sorts of different socioeconomic backgrounds, and they're all singing there together," she said. "And probably the most important thing they learn is that you have to learn to listen to the person next to you."